While there are numerous mysterious details surrounding the Ancient Anunnaki, most enigmas revolve around their physical traits, present in depictions all around the world. While the Ancient Anunnaki were nearly always represented in a humanoid form, numerous traits indicate clear differences between the Anunnaki and ordinary humans. The facial features of the Ancient Anunnaki Gods were alway well-hidden thanks to the large beards, and even though their facial features indicate a clear similarity with humans, there are many aspects that have led numerous researchers to suspect there is something off with the depictions of the Anunnaki Gods. Many believe that there is a clear connection between the Ancient Anunnaki and representations of Reptilian beings on Earth. Interestingly, the word used to describe the ancient Annunaki in ancient Mesopotamia was SIR, which translated means ‘dragon’ or ‘big serpent’. But there are quite a few details which hint towards a Reptilian origin of the Anunnaki, beyond the symbolism of the snake or dragon. To find crucial pieces of evidence, we travel to modern-day Iraq, in the Zagros mountains. At the archeological site of Jarmo, researchers discovered a proto-Neolithic community which vanished some 2,000 years ago. 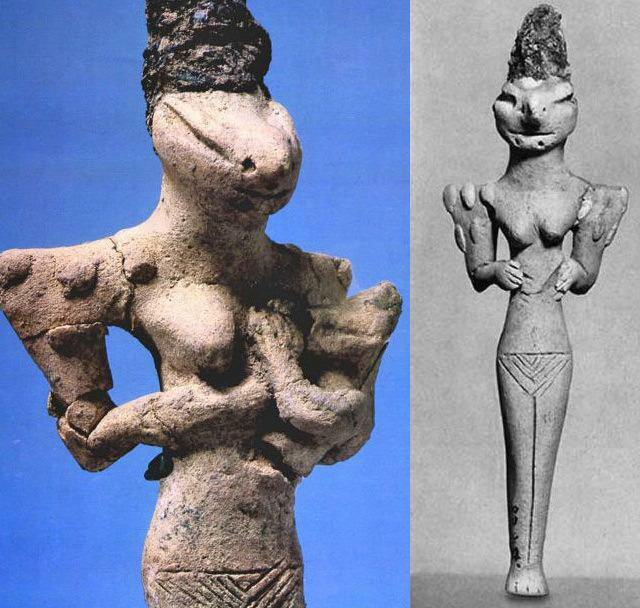 Among the thousands of mysterious artifacts and Sumerian statues of the Gods found on site, researchers discovered numerous representations of ‘The Mother Goddess of Fertility’. The only thing off here is the fact that the statues of ‘The Mother Goddess of Fertility’ show discrepancies which are highly unusual. While the figurines display an anthropomorphic body, the heads of the statues is anything but human with clear zoomorphic traits. Both male and female figurines display lizard-like characteristics: Elongates faces, elongated skulls, large oval-shaped eyes, and broad shoulders. But it seems that the Ancient Reptilian-like beings are in fact present in different ancient cultures around the globe, and it’s possible that all of them are depicting the mysterious Ancient Anunnaki. But similar accounts, of nearly identical beings can be found all over the planet. Looking back in history, we find several tales about strange creatures, that were worshiped by our ancestors. In South America, Quetzalcoatl, Kukulkan are some of the gods which are well, reptilian beings worshiped as gods. Quetzalcoatl is a Mesoamerican deity whose name comes from the Nahuatl language and means “feathered serpent” The worship of a feathered serpent is first known documented in Teotihuacan in the first century BCE or first century CE. This depiction is believed to have been made around 900 BC. To the Aztecs, Quetzalcoatl was, as his name indicates, a feathered serpent, a flying reptile (much like a dragon), who was a boundary-maker (and transgressor) between earth and sky. He was a creator deity having contributed essentially to the creation of Mankind. Kukulkan is the name of a Maya snake deity that also serves to designate historical persons. However, similar accounts of reptilian beings can be found in the Koran as well. There mysterious creates refred to as the Djinn, were according to texts, present on Earth prior to humans. The story tells that at one point Iblis, the leader of the Djinn offended God was rebellious and was cursed like the serpents in the Garden of Eden becoming Earthbound trapped on Earth for eternity. There is a Hopi legend about three cities on the Pacific Coast that were completely underground, and according to this legend, 5,000 years ago a meteor shower caused strange beings, described as the lizard people to seek refugee underground. These creatures constructed an elaborate network of tunnels located under Los Angeles, using advanced technologies that could even melt rock. In Benares, India there is a nearly identical legend that talks about the Well of Sheshna, which in Hindu legend is an entrance into an underground city of the Nagas that according to texts, are a race of semi-divine serpent people that live in an underground city, called Patala. According to mythology, it is a place of great power and only the holy could make contact with it. We have different cultures that practically share the same beliefs, cultures that according to history were never interconnected yet share many similar stories. As you can see, in nearly all ancient cultures accounts of reptilian beings are present. Ranging from ancient Sumer to Asia and the Americas, mysterious descriptions of reptilian-like beings are presentall over the world and all of them have many similarities in common. Is it possible that all of these ancient cultures descried the same race? Is it possible that all of them actually describe the ancient Anunnaki?